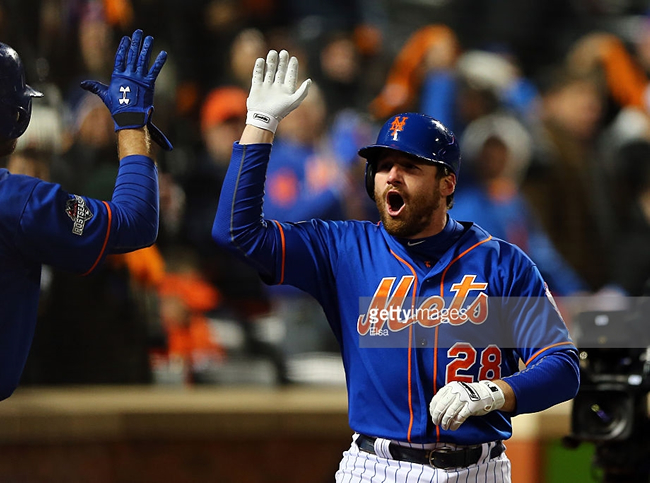 Should the Yankees Target Daniel Murphy? If you’re going to get hot, the perfect time to do it is during the playoffs immediately before you hit free agency. This strategy worked for Carlos Beltran in 2005, and it might be gangbusters for Daniel Murphy, now ten years later. Considering they have some instability and a couple of unknowns at second base, should the Yankees be looking to Queens to find their new 2B? Since Robinson Cano left town, it’s safe to say the Yankees second base situation has been less than ideal. Their first attempt to replace him was Brian Roberts last year, and he was eventually released and replaced by Stephen Drew, who was terrible and eventually replaced, more or less, by Martin Prado. They traded Prado away this past offseason and went back to Drew, and he barely managed to hit over .200 all year. All told, over the last two years, they’ve used Roberts, Prado, Drew, Brendan Ryan, Dean Anna, Kelly Johnson, Yangervis Solarte, Dustin Ackley, Gregorio Petit, Jose Pirela and Robert Refsnyder–eleven guys–at the position. Yeesh. Give or take an at bat or two, those guys combined to hit .246 with 31 HR and 112 RBI in 1,031 ABs. If not for a great run by Prado to end 2014, and the fact that Drew managed to hit 15 homers this year, those numbers would look far, far worse. That brings us to Murphy. Over the last two seasons, he has hit .285 with 23 HR and 130 RBI in 1,095 ABs, all by himself. I already like him better than the mostly garbage the Yankees have trotted out there over the last couple of years (with Ackley, Refsnyder and Prado being the exceptions). Murphy has spent his entire career in the Mets organization, ever since they made him a 13th round out pick of Jacksonville in 2006. He made his first All-Star team last year, and has had a very solid career, hitting .288/.331/.424 with an OPS+ of 113. he’s not a big-time power guy like Cano, but he’s averaged 41 doubles and 11 homers per 162 games over his career, which is pretty darn good too. One of the big knocks on Murphy is his second base defense. Unfortunately, his feet move like he’s got concrete shoes on, and he’s earned a reputation for having some of the worst range in the league. On top of that, he’s had some trouble staying healthy, as he’s spent time on the disabled in four different seasons, twice with MCL injuries (hence probably the bad range). While he’s not quite someone I would call fragile, the concern is definitely there that he might eventually miss some time with an ailment of some kind or another, specifically to his knees. Another thing counting against Murphy is the job that Dustin Ackley and Robert Refsnyder did while platooning at second base over the last few weeks of the season. Despite his lackluster performance since the Mariners drafted him second overall in 2009, the Yankees had been trying to get Ackley for years. They finally acquired him at the deadline this summer, and he immediately went on the DL. Down the stretch, however, he hit .306/.352/.694 with 4 homers and 11 RBI over his last 21 games. Did the Yankees finally figure out how to turn his career around, or was it just a good stretch of hitting? Refsnyder, meanwhile, mostly sat around when he was called up in September, but the Yankees played him once they got desperate for offense. Over his last eight games, he hit .355/.412/.548, and his two homers on the year overall were both total bombs. You could conceiably see the Yankees sticking with these two as a platoon for the forseable future, rather than bringing in another expensive and potentially injury-prone veteran. However, it’s hard to argue that Murphy wouldn’t be more of a sure bet, assuming he’s healthy, rather than relying on a guy who has underachieved his whole career, and another guy with less than 15 games under his big league belt. If they did sign Murphy, that could free up Refsnyder as another trade chip, potentially as a throw-in with a veteran like Brett Gardner, or some of the other kids we met last season. They could use Refsnyder and whoever, to tighten up another hole, like the one in the rotation. At the end of the day, I’m not sure what the right call is here. Murphy’s potential sure looks a whole lot better now that he’s crushing homers in the playoffs, but could the money it will take to get him be better used to sign another pitcher, or potentially a big-time outfielder if the Yankees do trade Gardner? It will be interesting to see where Murphy ends up, but I hope the Yankees are at least kicking his tires a bit.